Myo is a Greek word meaning "muscle" and therapy means "services to." 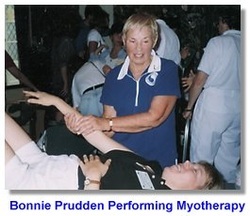 Myotherapy was discovered by Bonnie Prudden in 1976, and had received the name by Dr. Desmond Tivy. Myotherapy is based on the groundbreaking work of Dr. Janet Travell (1901-1999) along with David Simon's whom Bonnie was trained under. Travell and Simon's had established the neurophysiological basis of myofascial pain and its dysfunction, that contributed greatly to today's understanding of it. Bonnie created a new system of manual therapy, which focuses on the assessment, treatment and rehabilitation of associated pathologies, which contributes to the cause of muscular dysfunction and pain, thus affecting movement and mobility. It involved when Bonnie discovered how to ease pain in releasing trigger points in tight taut muscles, to which she would place pressure on the tender spot, and had noticed that the pain would dissipate under the pressure. She would inform her findings with Dr. Janet Travell, whom suggested how long to hold the point for, and therefore had allowed Bonnie to decide upon 7 minutes was long enough.This technique is now described as ischemic pressure. Later she worked along side Dr. Tivy. The working arrangements was that, Dr. Tivy would send the patient to Bonnie who would find the trigger points, mark them with ink and then send them back to Tivy who would inject them, by inserting a needle into the trigger point that Bonnie found. 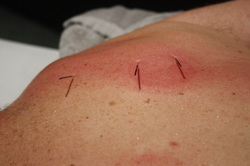 Today this technique is now known as Dry Needling. Along with dry needling, other forms of additional techniques used in Myotherapy are orthopedic assessment, Soft Tissue Therapy, Temperature therapies, Myofascial Stretching, Cupping, Electromechanical Stimulation and corrective exercise. Reduction of muscular pain, swelling and stiffness. Increase range of motion of the muscles and joints. Improved circulation and co-ordination. Greater flexibility and elasticity. Cupping is an age old therapy which originated in Eygpt and became popular around the World as an effective remedy for body pain, muscle stiffness and general soreness. Originally, early practitioners would use hollowed out animal horns to treat boils and draw out the toxins of snakebites and skin lesions. Slowly horns was replaced by glass and silicon cups, that are now used widely today. Cupping is a method of applying suction cups to the skin and muscle. A partial vacuum is created in the glass or silicon cups that are placed over the skin by means of heat or suction, sealing the cup to the skin. The skin underneath the cup becomes raised and the suction causes dilation of blood vessels and the release of waste. The benefits are as follows. Releases deep-seated tension within the muscles. Drains excess fluids and toxins. Brings blood flow to stagnant muscles. Loosens adhesions, connective tissue and knots. Breaks up stagnated waste and toxins. Treats colds and flu and musculoskeletal pain. Orthopedic testing is described as a pathological assessment of reproducing the onset of pain, in pinpointing the cause and symptoms, and establishing and accurate diagnosis for treatment. Soft Tissue Therapy STT is the use of the hands to target specific areas of dysfunction for the purpose of a therapeutic outcome. Techniques may include: Deep Tissue massage, muscle energy techniques, myofascial release techniques, trigger point therapy, joint mobilisation and lymphatic drainage massage. Temperature Therapies is the application of either heat (thermal therapy) or cold (cryotherapy). Techniques may include: heat packs, cold packs, ice baths, moxa and hot stone massage. Myofascial Stretching is the application of a range of stretching techniques, used to elongate the muscle fibres, return functionally short muscles to their optimal length and increase the ROM of a joint, leading to prevention of further injury. Techniques may include; static stretching, dynamic stretching and proprioceptive neuromuscular facilitation stretching. Electromechanical Stimulation (ES) is the application of electrical currents and soundwaves to produce healing and/or analgesic outcome. Techniques include: TENS therapy, interferential technique, therapeutic ultrasound and low level laser therapy. Corrective exercise brings the body back into a perfect postural position, and is part of any myotherapy treatment. It is any exercise planned and performed to attain a specific physical benefit, such as maintenance of ROM, strengthening of weakened muscles, increased joint flexibility, acts to permanently change dysfunctional patterns and is a vital injury preventive mechanism.